At the Shuttleworth Foundation, the geek factor runs pretty high for a charitable foundation. However, my colleague Jason and I felt like lightweights at the the Village Telco workshop that we hosted here at the Foundation two weeks ago. You can see the full list of participants here or click here to put a face to all the names but topping out the geek factor at the workshop were David Rowe, Open Hardware pioneer and developer of the Free Telephony Project; Elektra, author of the B.A.T.M.A.N. mesh networking protocol; Jeff Wishnie, Chief Technology Officer for Inveneo; and, Alberto Escudero-Pascual of IT46. The intent of the workshop was to bring together the right people to be able to prototype a Village Telco, with the intention of getting some configurations and code up on to the website so that interested parties would have something to hack on. As you can see from the picture at left, we had no shortage of wireless hardware to experiment with and four servers lined up to start assembling Village Telco software on. Well, as they say in the U.S. Army, “no plan ever survives contact with the enemy”. We never did build a prototype but we did something better, we brainstormed a new, low-cost startup model for a Village Telco. Low-cost wireless networking a powerful concept with a thousand potential applications. Unfortunatley, this strength is also its weakness in helping people get started with low-cost WiFi and VoIP. Because you can do just about anything, the endless configurability is an intimidating prospect for even the above-average geek. Our challenge was to create something simple enough to use that an entrepreneur with only modest technical skills could see how to implement and scale up a village telco. One early leap forward in the workshop was to recognise the superiority of the Ubiquiti Nanostation as an external access point. While there is no question that the Linksys WRT54Gx series of wireless routers have played a seminal role in the Open Source movement around wireless networking, there is no getting around the fact that they are designed for indoors and there is a significant cost increase associated with ruggedizing them for outdoors. The Nanostations cost the same as the WRT54GLs but come pre-built in a ruggedized outdoor housing with mounting brackets. The Nanostation is also more powerful than the Linksys routers. 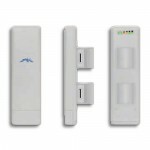 Having established a preference, discussion revolved around how open the Ubiquiti Nanostation is. The Nanostations can run OpenWRT and Inveneo had already had some success compiling the quagga routing protocol to run on it. Unfortunately, some of the tunable antenna functionality is lost with the OpenWRT software but this is not really a significant factor in the context of the Village Telco. The amazing thing about having Jeff and Elektra there was that they were able to test on the spot whether B.A.T.M.A.N. could be compiled for OpenWRT on the Nanostation. A couple of hours of quiet conspiring later and presto, the mesh protocol was running on the Nanostation! 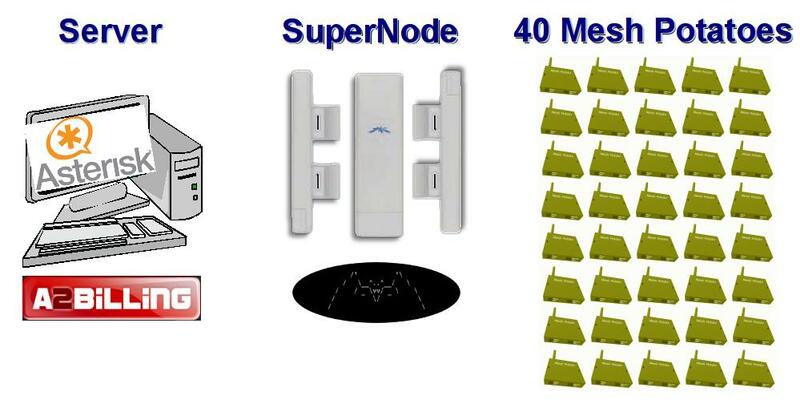 While the idea of a mesh network is to have each node extend the mesh, a good first step for a Village Telco would be to start with a “Super Node” which would help the Village Telco Entrepreneur (VTE). A Super Node might be three Ubiquiti Nanostations mounted on a single pole above the premises of the VTE. This would offer a 2 kilometre radius of coverage to the Village Telco. However, the Super Node reaching 2 kilometres is not the same as a VoIP handset reaching back that same distance. We had been thinking of typical wireless VoIP handsets such as the one by UT Starcom pictured at right. 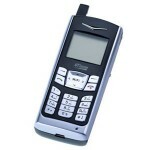 While this kind of device offers signficant advantages such as mobility and a built-in battery, it is also true that the range of such a phone is only about a 100 metres. Using this kind of phone would mean a dramatic increase in the number of wireless access points required to give service to a particular area. We either needed to think of a way of driving down the cost of an access point or increasing the power of the customer’s equipment. As an aside, the two key cost factors that emerged in the scale-up of the Village Telco concept were a) the cost of the customer’s phone or Customer Premises Equipment (CPE) as I believe it is called in the trade; and, b) the cost of power supply to the wireless mesh access points. We made the assumption that it was critical for the network to have guaranteed power but that it was a nice-to-have rather than a must-have for the CPE. As we brainstormed how to drive down the cost of the CPE, we discussed the potential of small mini-APs such as the Accton Mini-router sold by OpenMesh. These tiny APs are capable of running an adapted version of B.A.T.M.A.N. called, yes you guessed it, Robin. 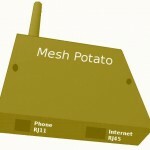 The combination of an OpenMesh router and a SIP phone would provide the CPE needed for a Village Telco. However, SIP phones are st ill not that cheap. 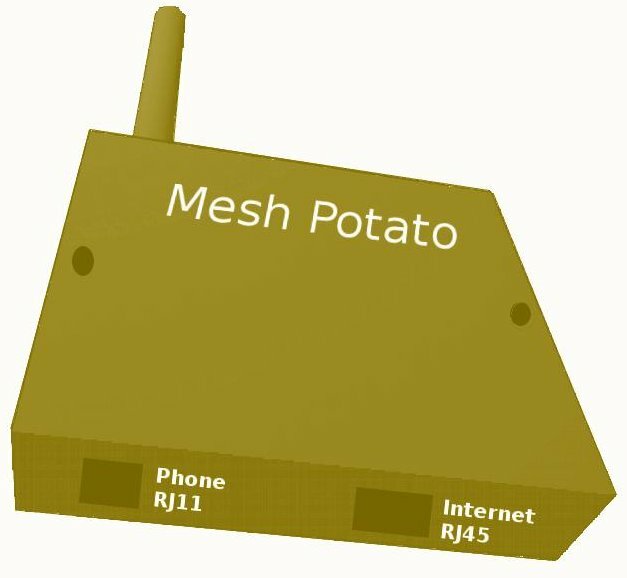 We decided that what would be ideal would be a combination of a simple Analogue Telephony Adaptor (ATA) combined with something like an Open Mesh mini-router. There is something to be said for having equipment right in front of you because the idea of actually gaffer-taping an ATA to an Open Mesh router actually struck a chord with the workshop. With a less amazing group, the conversation might have stopped there but as it turned out we brainstormed the existence of a device which we decided to call a Mesh Potato which would combine the functionality of an ATA and a mesh AP, and would be low-power, Open Source, Open Hardware, pre-ruggedized for outdoors and be easy-to-install and manage. Target cost of such a device would be sub USD 60 per device. In quantity, should we pull this off, the cost should be much lower. In my next post, I’ll talk more about scope of work involved in bringing these ideas to fruition. In the mean time, you can read the raw outputs of the workshop at http://wiki.villagetelco.org. If you are interested in getting involved as a developer, please sign up to the Village Telco development list at http://groups.google.com/group/village-telco-dev. This entry was posted on Tuesday, July 1st, 2008 at 5:17 pm and is filed under Village Telco. You can follow any responses to this entry through the RSS 2.0 feed. You can leave a response, or trackback from your own site.